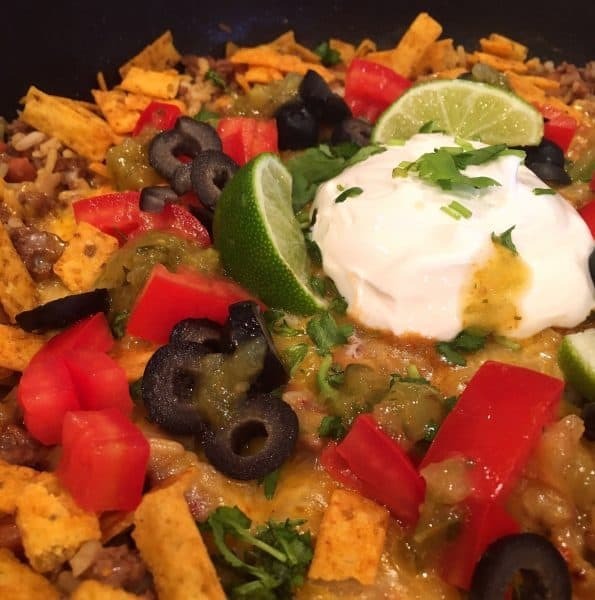 Hamburger Mexican Skillet is a quick, delicious, and economical dish that the whole family will love! 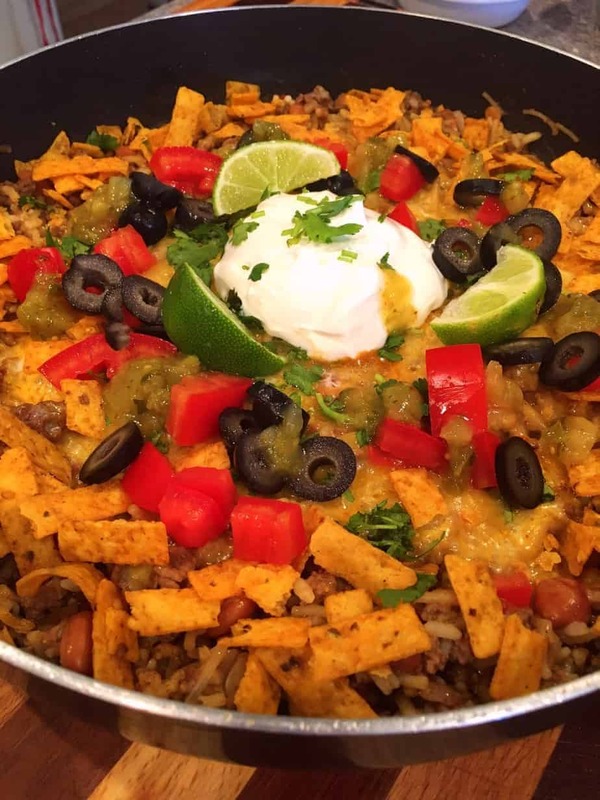 Loaded with lean brown ground beef, Taco Rice, Pinto Beans, Cheese, Sliced Olives, Diced Tomatoes, and topped with Chili Lime Tortilla Strips. It’s Tasty! 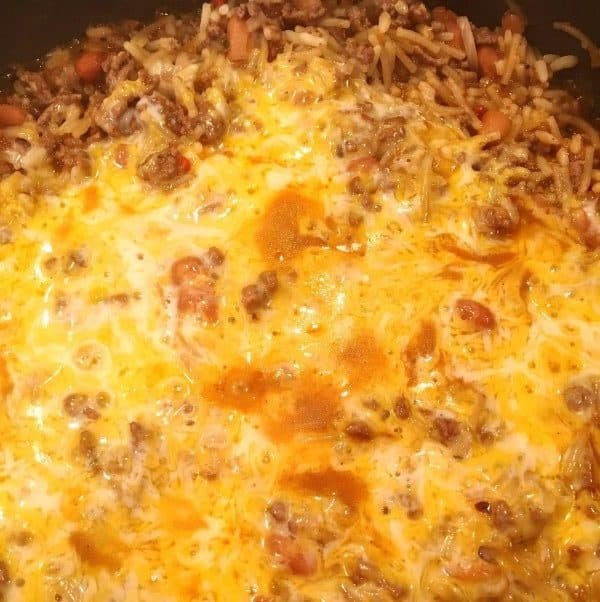 Y’all love my recipe for the Country Hamburger Skillet Dinner and commented over and over again how you love a quick easy dish you can make with hamburger. I get it! I really do. When our Nest was full and our budget tight…I was always looking for a meal that would stretch a pound of ground beef. Things haven’t changed that much…(except for the sagging and grey hair. 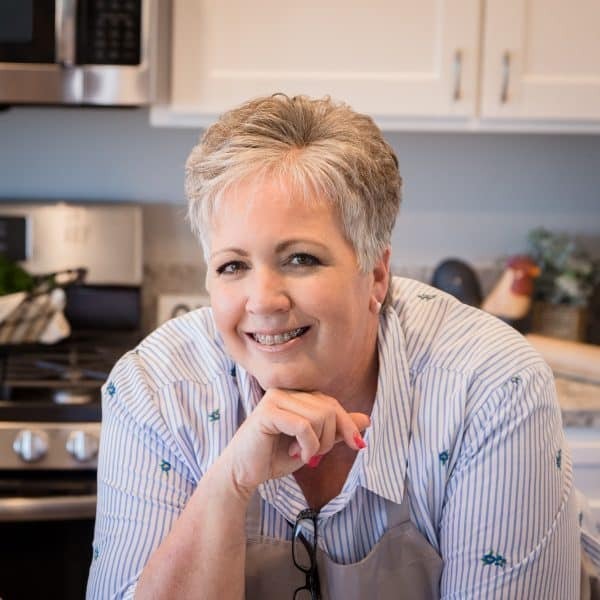 let’s not go there…lol)…and I still love coming up with ways to stretch a pound of hamburger into an appetizing dish the whole family will love. So I did! This is another simple hamburger dish that comes together quickly, is packed with flavor, and made in one skillet! Even better! 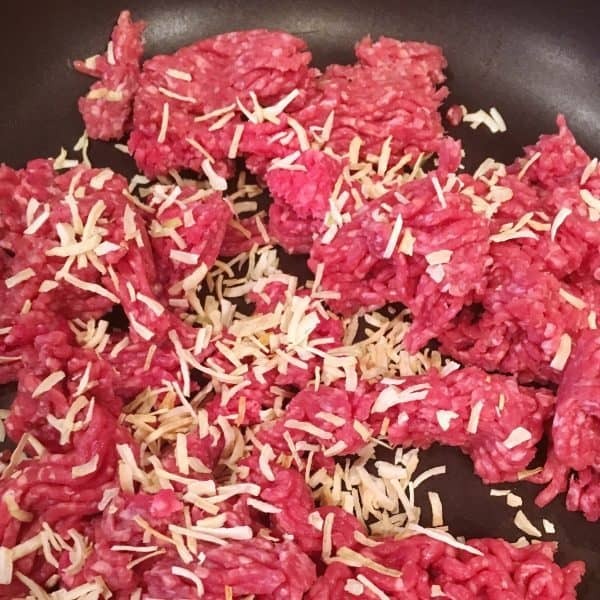 In a large skillet that has a lid, brown one pound of ground beef, in 1 Tablespoon of olive oil, with 1 Tablespoon of dried onion flakes. DO NOT DRAIN! We want all the flavorful juice from the ground beef and onions. Add one 5.4 oz. 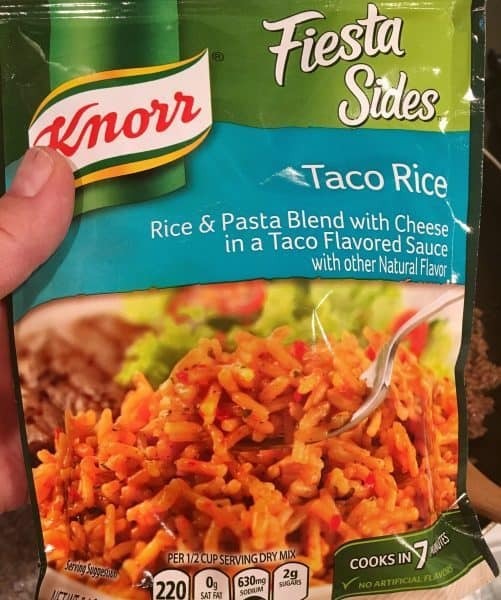 package of Knorr Taco Rice Fiesta Sides. Stir directly into the brown ground beef. Add 2 cups water. I know it seems strange adding water, but we need it for the rice and noodle mixture. Bring to a boil. 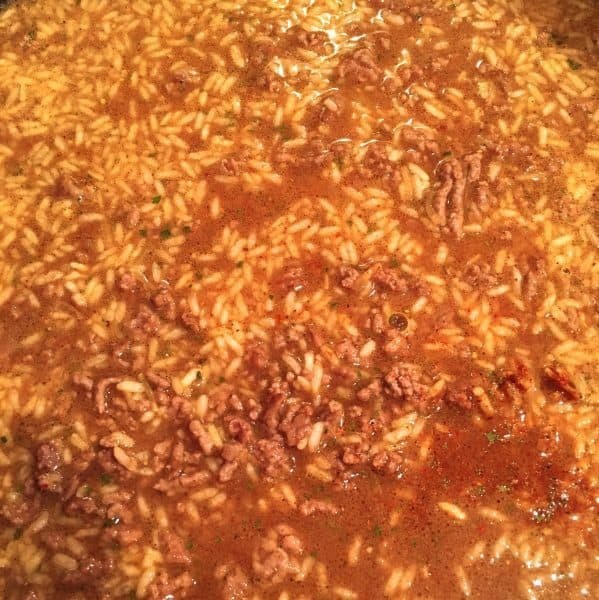 Reduce the heat, cover, and simmer for 7 – 10 minutes. Until most, but not all, the liquid is absorbed. Remove lid. Stir in 1 cup of rinsed pinto or black beans. 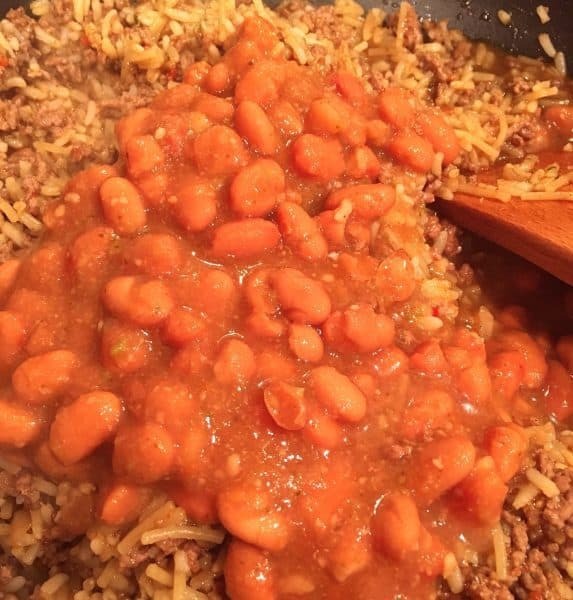 I used some of my left over Copy Cat Cafe Rio Pinto Beans, but any beans will work. TIP: If you are going to use plain pinto or black beans add 1/4 cup of salsa. Stir together and cover for another 5 minutes, or until all the liquids are absorbed. Cover until melted and gooey! Cause gooey is good! Remove lid and sprinkle the outside edge with 2 Cups of Texas Toast Chili Lime Flavored Tortilla Strips. Garnish with sliced olives, diced tomatoes, sour cream, lime wedges, chopped cilantro and a drizzle of Salsa Verde. BAM! Ready in less than 30 minutes! Isn’t this a mouth-watering dish? Like tacos in a skillet! Which I debated about calling it…but it just didn’t sound right…at least to my old hearing impaired ears! If you’re making this for a big family you may want to double the recipe…it’s just that GOOD everyone will want seconds…maybe even thirds! I hope your family, and your budget, love this dish! 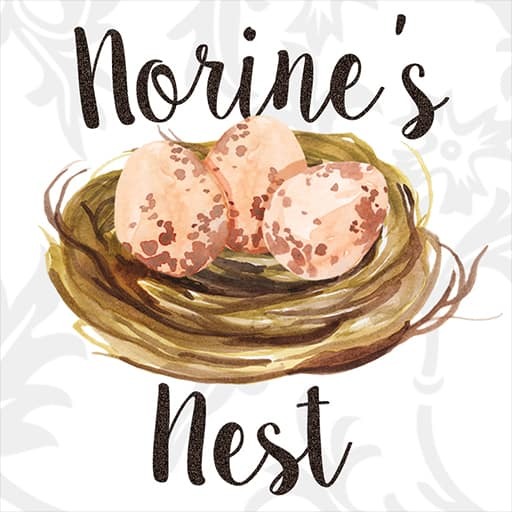 Happy Nesting! Sharing this delicious new recipe over on Meal Plan Monday. 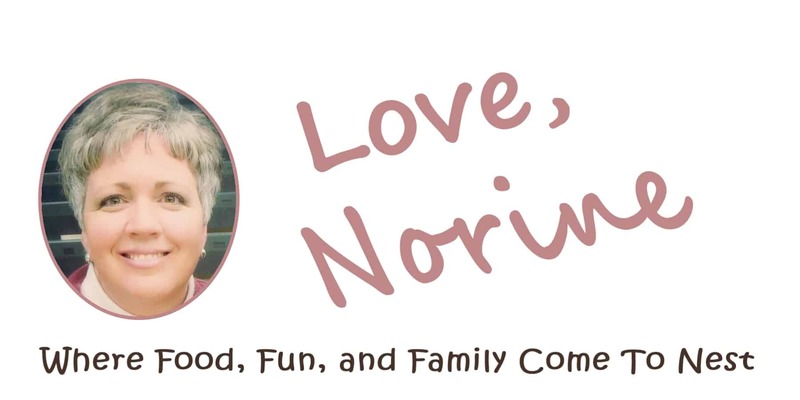 Click HERE to join the party! 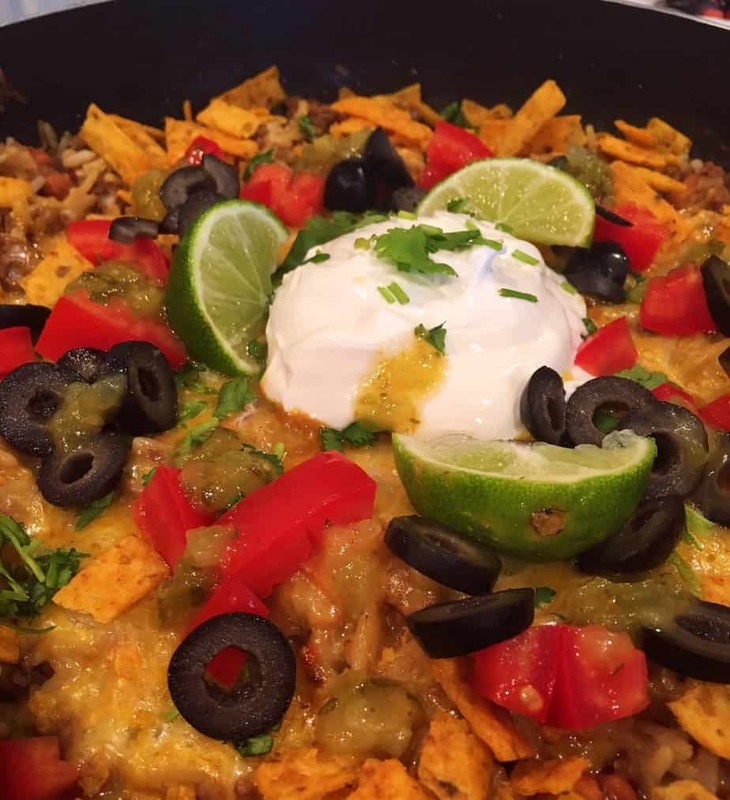 I’m sharing this yummy dish over on the Weekend PotLuck. You can join us by clicking HERE! Come join the party! A quick and easy hamburger dish full of savory Mexican flavors. 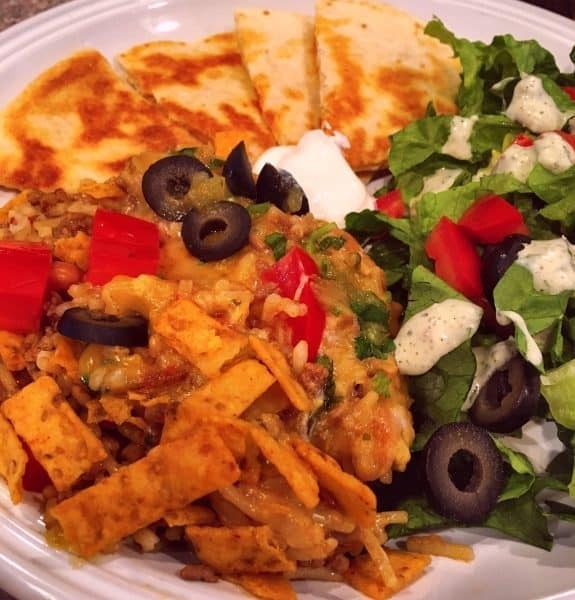 So tasty the whole family will love this dish! In a large skillet, with a lid, over medium high heat, brown ground beef in 1 Tablespoon of Olive Oil. 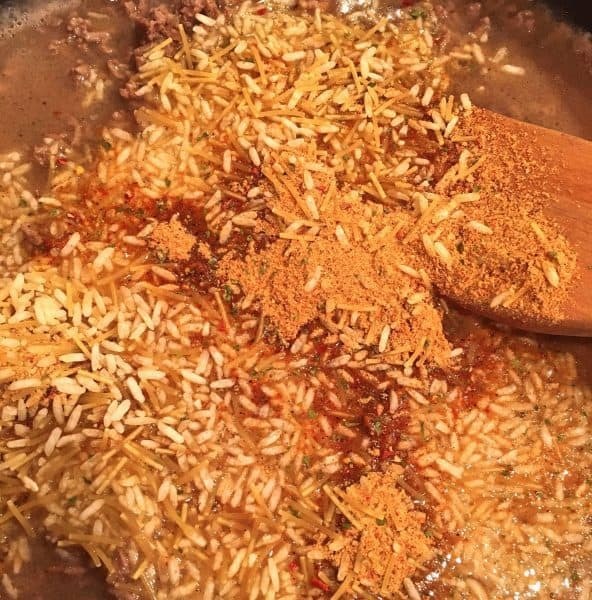 Add 1 Tablespoon of Dried Onion Flakes. Add 1 package of Knorr Taco Rice. Stir until well combined. Add 2 cups water. Bring to a boil. Reduce heat to low simmer. Cover with lid and cook for 7-10 minutes until most, but not all, of the liquid is absorbed. Add one cup rinsed and drained beans and 1/4 cup of your favorite salsa. Stir until combined. Cover and Cook until ALL the juices are absorbed. 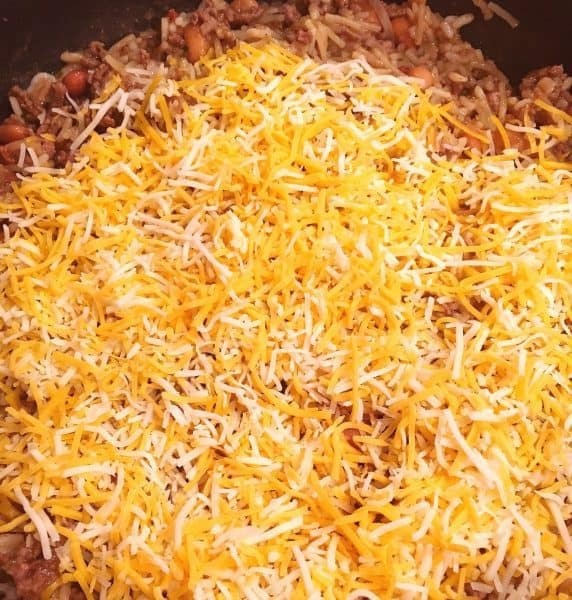 Uncover and top with grated cheese. Cover agan until cheese is melted. Sprinkle chili lime tortilla strips around the edge of the skillet. Garnish with Sour Cream, sliced olives, diced tomatoes, and chopped cilantro. Drizzle with Salsa Verde. Another delicious and easy meal!